How disappointing. It was supposed to have been covered by Steele Sports. Was any reason given? They apologised because just didn't have the staff this week. Thanks, a real shame that our game missed out. Here's the final table. A real shame that we won't be part of finals. We would have finished 8th if we'd beaten Canterbury. Craig Garvey and Adam Elliott were two players among 32 others that came out of a brutal North Sydney Bears v Canterbury Bulldogs game battered, bruised, and worse for wear after a semi-final style of football that maintained its intensity for 80 minutes. The result determined which side would qualify for a top-eight spot, which is quite remarkable for a Bulldogs outfit that did not record their first win until Round 10. 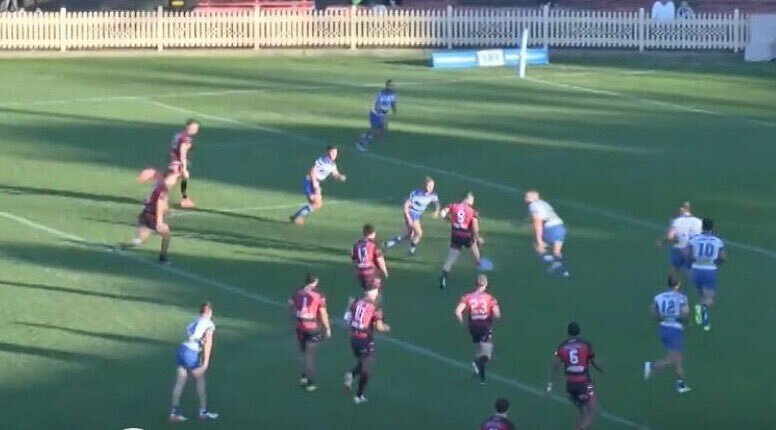 Neither player walked off North Sydney Oval last Saturday surprised at the physicality of the match, and admitted a unique love-hate relationship they share with playing the Bears. "I love playing them, they're the team that I love to hate because it's always going to be a tough game against them," Elliott explains to NSWRL.com.au. "It was war out there [last Saturday], I was talking to my girlfriend after the game and it was probably the roughest game she's watched us play all year; a couple of the boys came out of it pretty sore, battered and bruised. "The intensity in the 70th minute was the same as the first set, it's just so competitive and we've had some really good battles over the past couple of years." It was a scoreless match for half-an-hour, with only four points separating them at both half-time and full-time, with the Bulldogs prevailing in the 10-6 grind. The Bears believed they won in the final minute of play, but an Jack Gosiewski would-be try was denied after he was ruled offside, and the ferocious 80 minutes mixed with the tense ending had Garvey extra-satisfied with the win after the game. "North Sydney are always a hard team to beat, especially on their home ground," Garvey told NSWRL.com.au after the match. "We knew we'd have to grind out the full 80 minutes and we nearly lost it on the kick at the end. It was a scrappy win, but we'll take it. "We knew it would be about defence here, North's really defend well and they came at us." Both sides were playing for their season, something the Bulldogs are used to since they've partaken in plenty of must-win games due to their horror start to the year. While that kind of pressure is not ideal, it has set them up for semi-finals football, which begins this week against the Wyong Roos. Since their first win of the season in Round 10, they have won 10 of their past 14 games, and while there is no single factor for their mid-season surge, the inclusion of certain players helped their cause. Garvey and Elliott were playing NRL at the start of the year, while Asipeli Fine and Lamar Liolevave were both mid-season signings from the Wests Tigers. It may have taken a few rounds, but the continuity between players is shining brightly at the right time of year. "Lots of the boys did pre-season with the NRL, so I think it's just been a matter of playing with each other," Garvey explained. "The more we play together the more we've gotten better and better. "[Playing NRL] has helped me, I've gotten better the more I play with these boys, but I'm really grateful for Des giving me an opportunity to play in the NRL." Elliott praised the belief shown by the players who played and trained to make the finals, despite being the situation of having not won a game by Round 10. "I think the boys have always had the belief and enjoyment of turning up to training to play with each other," Elliott said. "There was a couple of close games where we lost on the buzzer where we'd been ahead at half time. It's a really young side so I think it was just a bit of experience, there's a few boys that can still be playing under-20s that are playing for us so I think the start of the year was a big learning curve. "Now I feel like there's a lot more experience in the side, and more of a will to dig deep and a belief that when games do get down to two or four points that we will be the team to come through and be on top." The Bulldogs have won three games in a row, and that streak will have to extend to seven if they are to win the competition. It begins with the Wyong Roos this week; with both teams claiming one win each in their two encounters this season. "[Wyong] have a great side, the same sort of thing as North Sydney Bears, every time I've played Wyong, it's just been a big grinding match," Elliott said. "It's going to be a tough game, they've got a lot of Roosters boys back and a lot of NRL experience in that side as well. "I think it's just up to us to try and continue the run that we're on at the moment, focus on ourselves and trying to get a spark up for us." Garvey praised the defence shown by the Bulldogs last week, but admits they need to work on their attack for the upcoming Wyong match. "Our defence is pretty good on our line, but our attack can definitely improve more, we were a bit scrappy and we'll focus on that throughout the week," Garvey said. The Bulldogs and Wyong will face this Saturday at Pepper Stadium with a 3pm kick-off. What were the thoughts of our sideline eye Bears? And was it a touchy call or from the ref? Any word on what Benny Gardiner and the players thought? It was the touchie's call. Apparently from the audio from the video, the touchie called it straight away. Clearly it was a terrible call. I can understanding when touchie's miss offside calls, but to call a player offside when he is not is unforgivable. To call a player offside, you must see that the player is offside. I have no idea what the touchie was looking at. Regardless, the Bears over the past 4 weeks, only had to win one game to make the finals. We had our chances, and despite the effort (can't fault the players' effort) we simply were not good enough. Thanks B4L it always defies belief when touchies do stuff like that...was he bored? Did he not have any calls throughout the game so he wanted to make his mark? Does he just need to go to Specsavers? Anyway, I think we deserve to be in the 8 and it is a shame we're not. Plenty of positives to get out of the year, but I guess the boys are'nt feeling that right now. Head up Bears...we're proud of you....Stand Aside 2017! The Bears passed up the opportunity to kick a penalty goal from in front of the posts for first points (a poor decision, given the regular kicker was out and the playoff for 8th spot looked like being a tight game). Canterbury's first try looked to be scored off a foward pass. Bad luck losing Talaki and Siejka who were both playing well until injured. Bears conversion kick bouncing off the upright. Abbas Miski ruled held up over the line. Maybe he was? Dunno. As the above photo clearly shows, the Bears were robbed of the match winning try. The Bears attack in this game was clunky; lack of organisation in the opposition quarter, some of nothing kicks from the halfback. The Bulldogs weren't great either. Small consolation; hot head Elbows Elliott had a poor game for the dogs. On form, neither side looked like they would go far in the finals. Despite more losses than wins, the Bears generally put in, in 2016. Early season form showed promise. Hopefully a good squad can be assembled in 2017 the boys find good form at finals time. Go the mighty Bears!! !